Our third grade year is coming to a close in a few weeks. Third grade was fun. My daughter seemed to start as a young child and emerge with the makings of a young lady. All of her prior skills sharpened, and she enthusiastically took on more complicated things and demanded more independence, every now and then reaching back to feel if I was still there. Although intensely longing for her independence, when she reached back for my reassurance, I grabbed that precious, small but growing, hand and hugged it to me with all the strength, love, and guidance that I have. My oldest daughter began learning cursive in first grade and we hit it really hard in second grade. In third grade, we have been just been fine-tuning print and cursive handwriting along the way. 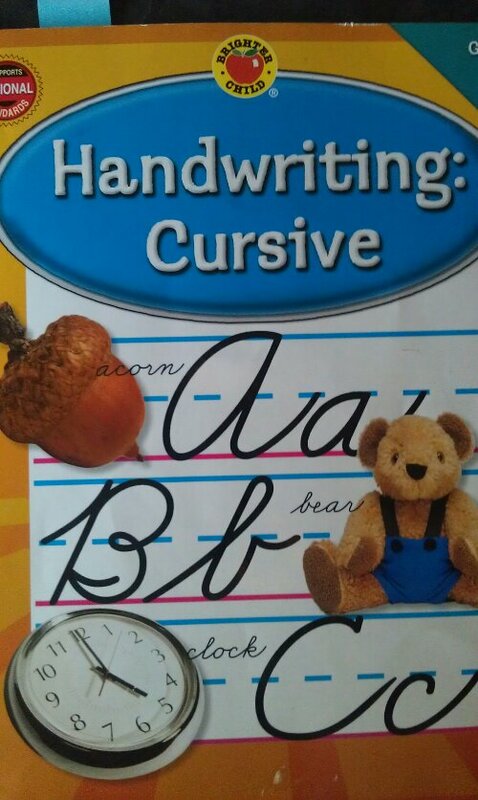 Why did we start cursive so young? Let’s just say “backwards letters.” I read somewhere that children struggling with printing backwards may do well with cursive, since you “can’t make cursive letters backwards.” The concept in practice worked moderately well, but let me tell you, you can make cursive backwards! For third-grade handwriting, I simply picked up a workbook or two at McDonald’s (no, kidding, Office Depot or somewhere like that, just nowhere “fancy” and certainly not expensive!) to remind ME how to make the letters, and we worked through them. If I didn’t like the way some letters were presented in the book, I’d teach her my own way, or both ways and let her pick. As long as she CAN write nicely and CAN read cursive, I’m good. 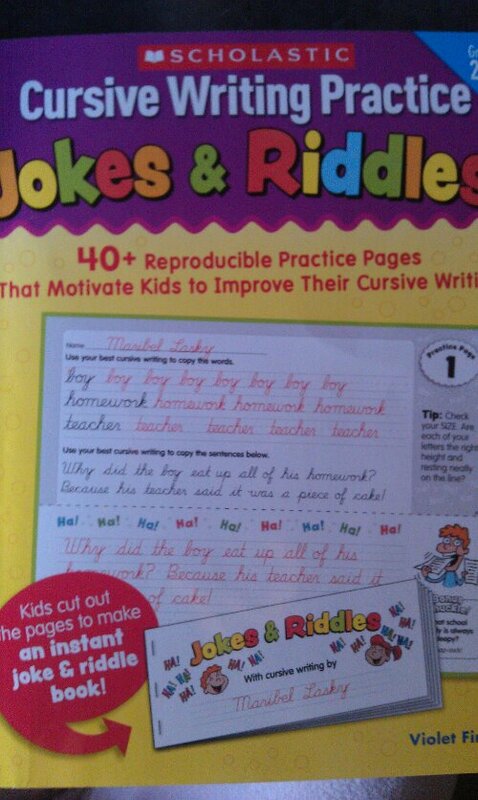 We also picked up a cursive Jokes and Riddles practice book because my daughter has a great funny bone. Aside from the handwriting workbooks, we just incorporate handwriting practice into other lessons. For example, there will be times when I ask grammar to be done in her “best” handwriting. Sometimes it is stunning. Other times, well, you can clearly see my daughter hates the physical act of handwriting. Aside: Now, by the end of third grade, my daughter is finally, on her own, catching and correcting it when she makes backwards letters. Usually, they say the formation of backwards letters should disappear by the end of second grade, so it was a bit disconcerting to see this still around during her third grade year. However, my husband clearly remembers that he, too, had this problem as a child, so we just watched her closely for any other signs of learning barriers. We have satisfactorily used The Story of the World (Susan Wise Bauer) for the last three years. We are on Volume 3: Early Modern Times. 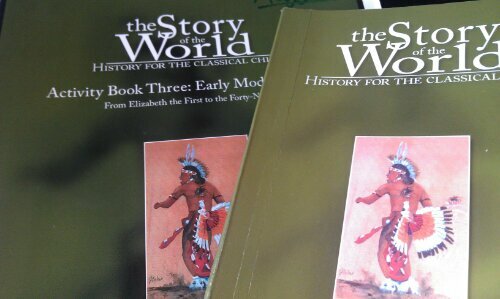 The history book contains 42 concise, fairly interesting lessons, and we cover 0-3 lessons per week. I also buy the Activity Book, which has maps, coloring pages, suggested reading, and hands-on project ideas. There is also a “test” booklet, but we did not buy it because I like to quiz my children aloud to assess learning. The activity book is chock-full of stuff to keep you super busy if you choose. If we tried to do much in the way of supplemental reading or projects, we got behind this year. In first and second grades, we had less other school material to cover, and we really threw ourselves into history and the recommended reading and projects. Now that my daughter’s curriculum has broadened due to increased learning capacity, we stick basically with the history book lesson and move on. Generally, I read the chapter aloud to both of my school-aged kids at the same time, making commentary, asking questions, and having the kids go to the map and show me the places we’re reading about. (I invested in a huge wall map and I think it helps their geography knowledge a lot. Well, at least it helps mine.) While I read, they look at and/or color the activity pages. Conversely, they’ve got CDs with the lessons read aloud and you could check them out from the library or maybe purchase online. This would free up some hands for supper making. We rented them from the library sometimes, and the kids liked the break from mom. There are four volumes of The Story of the World. It is recommended to do one volume each year, and at the end of four years, begin the cycle again. I believe I will stick with the curriculum, and hopefully begin incorporating more supplemental reading and projects as the girls gain independence. Perhaps, then, in high school I can add in testing from the booklet. I don’t know. We’ll see. Probably like most home school families, we count extracurricular activities as PE. We have participated in formal dance, tae kwan do, gymnastics, basketball, and swimming activities. Weight-bearing activity and sunshine are important for the physical body, and so anytime I can get my kids to play outside, we do. I have two main religious homeschooling goals to accomplish before my kids leave my house. One, that they know it is the love of Christ which bridges all divides they’ll ever face. Two, that they learn some Bible history. Currently we’re working on both, but we have far to go on the Bible history. This year we memorized and wrote out all the verses on Sing the Word from A-Z and have been working through Egermeier’s Story Bible. Sing the Word has been enjoyable for us, and I love learning the memory verses to catchy music and singing, sometimes dancing around the room as we learn them. Egermeier’s Story Bible brings the Bible alive on a personal level for the children, and even me. Miscellaneous fun reading comes up on St. Patrick’s Day, Christmas, Valentine’s Day, as well as other days. One book we all particularly enjoyed this year was Dangerous Journey: The Story of Pilgrim’s Progress by Oliver Hunkin. Spellbinding! I guess that’s it. I have not formally taught arts and crafts this year. My kids do that on their own, above and beyond anything I could ever dream of or do. If you care to comment, please do! Or e-mail me with any questions about what we used for our third grade curriculum. This entry was posted in Homeschooling, Third Grade Curriculum and tagged Egermeier's Bible Story Book, handwriting, history, Homeschooling, PE, religion, The Story of the World, third grade curriculum on May 13, 2013 by thehomeschoolingdoctor.